Sports cars. Winding mountain roads. Resorts and spas. Sound like the perfect automotive getaway? Look no further than just above our borders to the providence of Quebec Canada. If you’re unfamiliar with our neighbors to the North, you are missing out on a wonderful and diverse region of North America. As of last October, I too was unaware of all the wonder within Quebec. My son has been to Quebec numerous times and suggested we pick the middle of October. Canada’s gorgeous leafing season was still happening so it was the perfect chance to experience some crisp weather without compromising the driving experience. Flying into Montreal, we kicked off the trip by taking delivery of the cars downtown at our hotel, exercised them on a jaunt up to the ski village at Mont Tremblant, and finished our trip returning to Montreal to explore the historic Old Quay (Port) District. The cars. Oh, what to choose from! 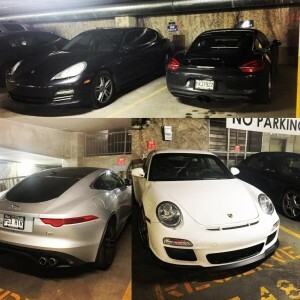 We researched and found a great exotic car rental company in Montreal that had Porsches. Yes! Perfect! 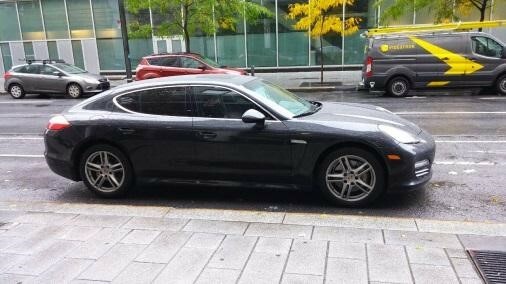 I decided on the Porsche Panamera 4S for its blend of V8 power, paddle-shift transmission, dynamic driving, and room for luggage (and all-wheel drive as I was less optimistic than David of the possible snowy weather!). 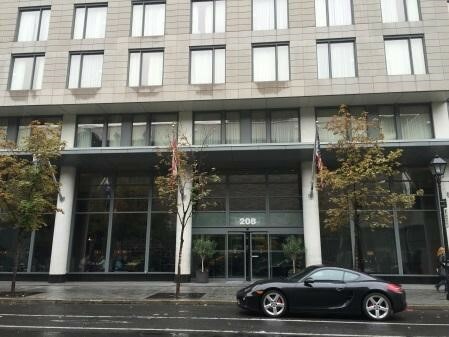 The rental car company was very attentive to our requests and provided delivery and drop off services to our hotel. David and I were like two kids on Christmas morning waiting for them to arrive. Both were black with black interiors, which gave some definite uniformity to this “German Smokey and the Bandit” two-car caravan. Anxious to hit the road, we left Montreal for Ile de Perot, an island on the St. Lawrence about 25 minutes due West. Or “Ouest” I would soon learn was the French word for West. It was written on all the highway signs as Quebec is a French-speaking providence. OK, well “Ouest” we go! The island of Ile de Perot is a residential community replete with golf courses and beautiful views of the St. Lawrence. We stopped at one of my late father’s favorite golf courses, Club de Golf Windmill Heights on L’lle de Perrot Isle. Pulling into the parking lot I spotted the perfect backdrop for a picture with the cars. The colors on the leaves were so vibrant and outstanding; as if a gift from my dad! This special detour complete, it was onward to the mountains! 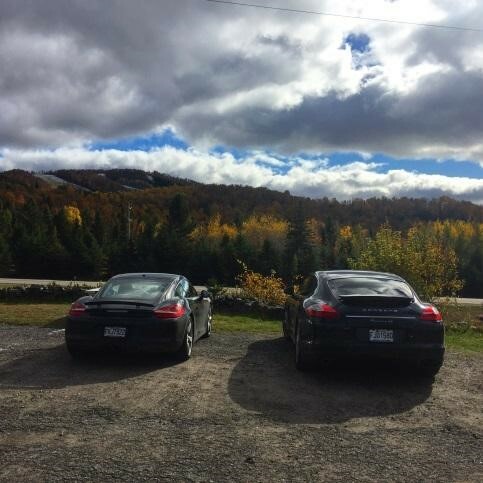 Once on the winding highway driving Northward to Mont Tremblant Ski Village we had the thrill of seeing just what these cars were capable of doing! 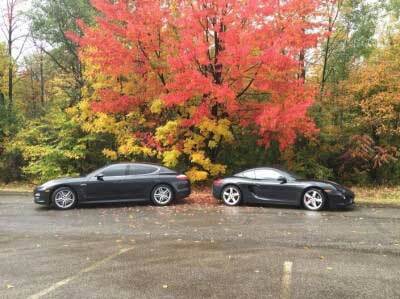 David’s Cayman S, making 325hp, was superb motivation for the car. 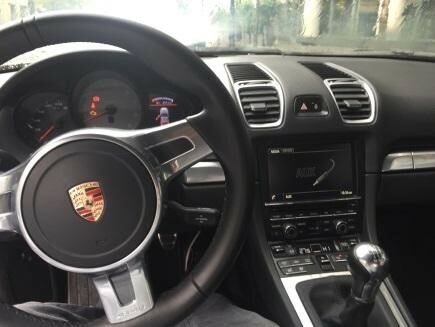 But the 420hp of my Panamera 4S, even loaded with luggage, more than kept up with the pace. It was fun to see just how much power and tight handling the cars exhibited. The scenery along the way was spectacular! Fortunately for us, the fall leaves were in full color along the entire drive. Weather in Canada in October is unique as you may encounter any of the four seasons. 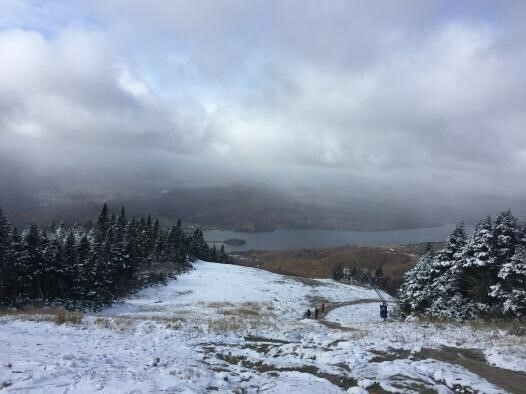 We enjoyed everything from sunny blue skies to rain showers to even snow showers! All within a 3 hour time frame! We were in our glory! Our co-pilots and passengers, my husband Jeff and David’s girlfriend, Ashley sat back and enjoyed the scenic ride. Making it to Ski Village by that evening, we checked into our hotel and reminisced about the day’s events over drinks and Beaver Tails, a tasty Canadian dessert pastry. You’ll want one, try it. The next morning David and Jeff hiked to the summit of Mont Tremblant while Ashley and I shopped in local stores. Four hours later and exhausted, they returned triumphant about their accomplishment. Twenty minutes later David, Jeff, Ashley, and I were at the snowy summit again taking photos of the gorgeous views thanks to a cable car tram that takes visitors to the top throughout the day. David and Jeff were less than amused when we pointed out we also made it to the Summit with our Starbucks coffee in hand. Hey, I work smarter not harder! Leaving the mountains, we savored every minute of the return drive to Montreal. 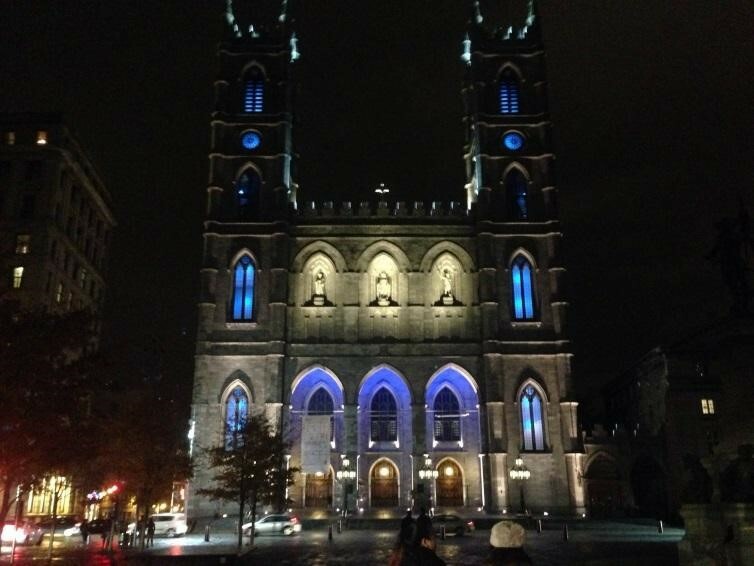 Arriving into the Old Quay District, we made time to stop and experience the Notre Dame Cathedral Basilica (taking many cues from the Notre Dame in Paris, France) after walking down to the riverfront. Used as a trading post and shipping port dating back more than 200 years, we explored the beautiful architecture of the old buildings and dined at Gibby’s Steakhouse, set in an old stable dating back to the 18th century. 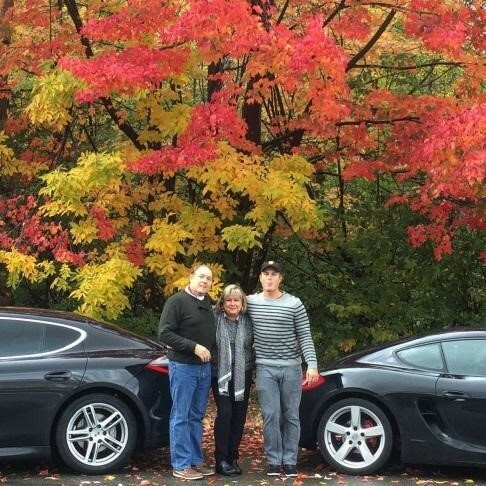 We made some awesome memories as a family on the trip while enjoying and celebrating our passion for cars! We’re already talking about this year’s trip to Canada and whether or not we dare to rent the Lamborghini and Ferrari. Only time will tell, but we’ll be sure to share photos if we do! P.S. Once back at the hotel our rides were in great company before being returned to the rental company!